» Prediabetes: Do You Need to Count Carbs? An eating disorder you ask? You already have a greater risk of getting an eating disorder when you have Diabetes, so why set yourself up for a disaster by adding carb counting to the mix? 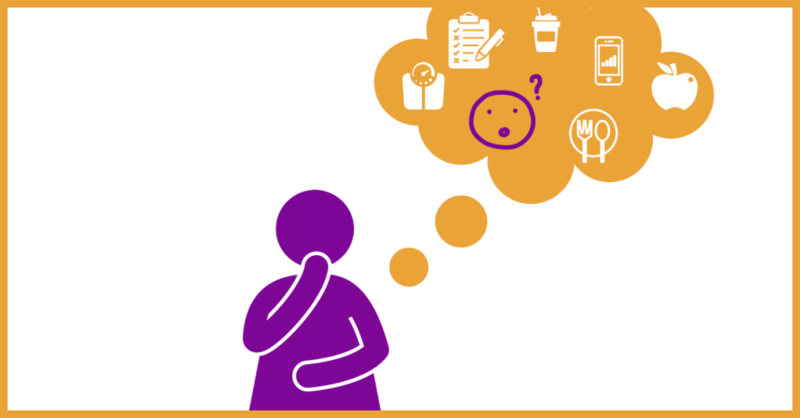 Anorexia nervosa, bulimia and binge-eating disorder are more common in individuals with diabetes than in the general population. As well, all this carb counting is totally unnecessary anyway if you follow the 95-5 Wellness Solution - which is a healthy whole foods diet high in fiber. Now, I know some ladies are NOT going to listen to my good advice and they'll count carbs anyway. Because ladies tell me all the time that they are NOT going to listen to me! (I still try to convince them though because I've seen a lot of damage from obsessively keeping track of food). ...you must promise me, cross your heart and be honest, that you'll first take my test below BEFORE you choose to count carbs. AND you have to be sooooooooo careful to not cross that line. If you can't pass my test below, don't count carbs! ...you owe it to yourself to answer this question for yourself, "Do you need to count carbs?" And the way to answer that question is by passing my test, with NO questions answered with a '"Yes, that's me". ...then the answer to the question "Do you need to count carbs?" is a resounding NO! Don’t even think about doing it. The good news is you actually don't have to worry about over eating at all...if you follow the 95-5 Wellness Solution that is. With the 95-5, it's next to impossible to over eat. I’ll explain why below. Will You Overeat If You Don't Count Carbs? For millions of years, humans ate without the aid of a calculator, a scale or an app. Yes, I know it's hard to accept that an app is NOT necessary, but it isn't! The human body has hormones that tell you when you're hungry AND when you're full. These "I'm hungry" and "I'm full” hormones work really well if you eat natural whole foods high in fiber. Because natural whole foods that are high in fiber fill you up, so you naturally stop eating! When you eat more fiber, you'll start recognizing your 'I'm full' feeling AND know when to put down your fork. ...regardless of whether or not you passed the "I Don’t Have Any Issues with Food or Myself" test. If that's you, then please at least use these following Prediabetes Macronutrient Guidelines when you plan your meals. AND I stress the word "Guidelines". These are not hard-and-fast rules you must strictly follow every day. For example, if you eat a little less fiber one day, that's okay. Or if you eat a little more than 200 grams of healthy whole foods carbs one day, that's okay too! Your meal times should NOT be a math exercise with food scales AND calculators AND you spending all your time with your head buried in a food logging app. Way back at the beginning of this post I mentioned that counting fiber is a much better exercise than counting carbs. 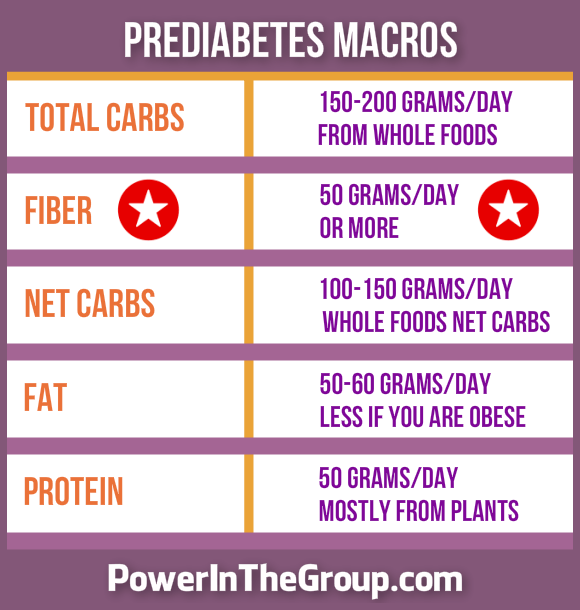 AND you'll notice on my Prediabetes Macros Chart (above) that there's actually a line for fiber! ...Dietary Fiber is an essential nutrient you need to be healthy! If you skip eating fiber, you'll experience MANY, MANY, MANY health problems. So, if you really want to count something, start keeping track of the fiber you eat. Fiber Supplements don't count as fiber FROM FOOD! Instead, just keep track of the fiber from all the plants you're eating. Do you want to know something? Nothing will help control your blood sugar better than eating lots of fiber. Fiber is found in all plants. Veggies, fruits, nuts, seeds, baby and red potatoes, squashes, whole grains, and beans and lentils all are rich with fiber. Meat, dairy, eggs and fat have NO fiber. You'll have a heck of a time controlling your blood sugar if you eat no high-fiber foods that come from plants. You'll also increase your chances of getting cancer, heart disease and many other terrible chronic diseases. If you start sounding like a tuba (I mean farting a lot), then slow down on the fiber! Just add about 5 to 10 extra grams of fiber a day for two weeks. And then increase by the same amount every two weeks, slowly getting up to at least 50 grams of fiber a day — everyday! Increase your water intake too. You need way more water to digest all that fiber! You can learn more about eating a high fiber diet here: Fiber and Prediabetes. I hope you enjoyed my blog post Prediabetes: Do You Need To Count Carbs? And I hope you seriously consider NOT counting carbs but rather counting fiber instead. Your body will thank you for it and reward you with better blood sugar control!